When we ask students why they start training with us, responses vary considerably. 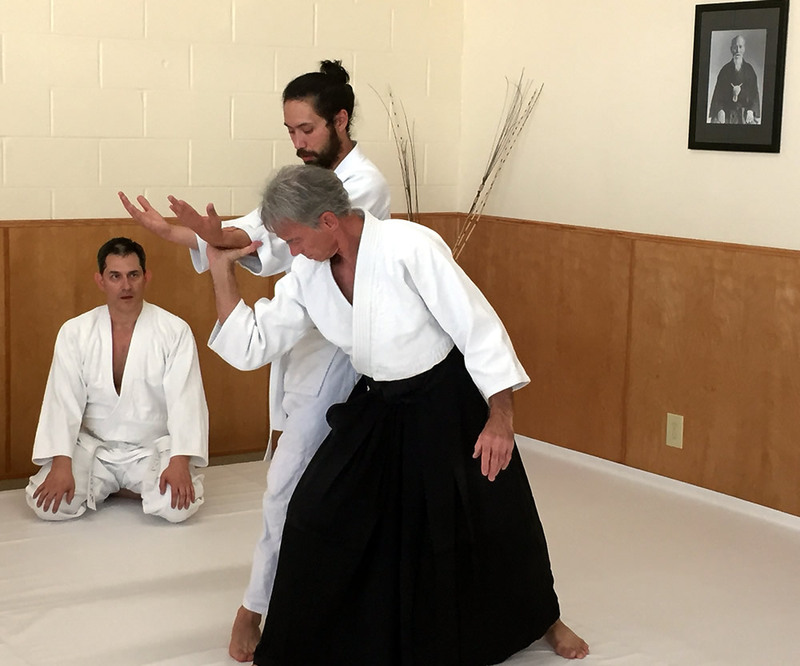 Many are interested in the martial, self-defense aspects of Aikido training. Others are looking for a source of exercise that goes beyond basic fitness training or conditioning. Some are attracted to the powerful, graceful movements found in Aikido, while others are interested in exploring mind-body coordination. For most, it is a combination of these and other factors. Indeed, there are as many different reasons for beginning Aikido training as there are students. What they all have in common, though, is a spirit of exploration – a desire to try something different and to embark on a new path without knowing exactly where that path of personal discovery may take them. Why do students continue to train with us? Again, the answers from long time students are as varied as the students themselves. Our membership includes men and women from a wide array of backgrounds, ages, and occupations. Many enjoy the camaraderie of working with other dojo members and the spirit of cooperation that exists whenever we are training. Others appreciate the sense of accomplishment they experience as their skills improve over time and they begin to appreciate the subtleties of the art. And still others like the broad range of martial skills covered in the Shin-Budo Kai curriculum. Ultimately, most of our students come to realize the value of just plain training—they begin to understand that the path itself, and not a perceived destination, constitutes what is truly important. For centuries in Japan, budo (the martial way) has been a path that includes both rigorous practice and sustained introspection. Aikido’s founder, Master Morihei Ueshiba, noted that in real budo there are no enemies and he emphasized agatsu or “victory over self.” Within Shin-Budo Kai, we seek self improvement through diligent and in-depth study of the martial ways. We do so not so much to defeat others, but to achieve that level of self-control that allows us to follow a more harmonious path – a path on which we invite you to join us. If you are interested in finding out more about Aikido, please give us a call or send an email to asbkdojo@msn.com. We encourage all potential students to stop by the dojo and observe a class. Visitors are always welcome. Also, we offer free introductory classes the first Monday of each month. Please see the Intro Class page for further details. New students are welcome to begin at any time by attending our All Levels Aikido classes on Monday evenings or Saturday mornings. $65/aikido, $50/iaido, $85/aikido plus iaido; No Contracts. Family, student, military & law enforcement rates are available - just ask us.